The crack of the bat, the pop of the ball and the roar of the crowd signal opening day for Major League Baseball teams across the country. Over the years walking through the turnstile on game day was preceded first by the tearing of tickets and more recently by the scanning of bar codes. This year, however, the Washington Nationals franchise are taking it a step further issuing contactless smart cards for season ticket holders. The Nationals are using a system from UK-based Fortress GB, which has deployed system for English Premier League teams including Liverpool, Manchester City and Arsenal. The goal of the system is to offer a complete fan experience, says a Nationals spokesperson. Season ticket holders will simply tap-and-go to enter the park using high-speed turnstiles. An online management system enables cardholders to manage and transfer tickets via the Internet. The cards include a loyalty and marketing component as well. The Red Carpet Rewards program enables fans to redeem points for seats, suites and parking passes. They can also choose to participate in online auctions for merchandise and experiences. The Nationals are also working on an electronic purse application so fans can use their card for the purchase of concessions or souvenirs at the ballpark. Much like a debit card, fans could add money via the online account and even authorize an “auto-top up” feature. The delivery of real-time offers via email or text message as soon as ticket holders enter Nationals Park could revolutionize communication between the franchise and its most loyal customers. “We could, for example, reward fans who arrive one hour before first pitch with a special offer via email or text as they enter the ballpark,” the spokesperson says. It’s possible other applications could be added to the cards down the road. The infrastructure enables use of these cards at non-baseball events hosted at Nationals Park. 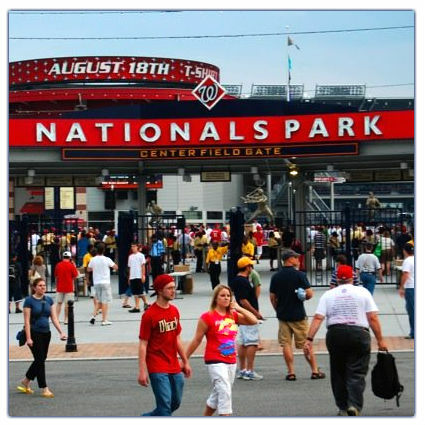 “Future ideas include using access cards in lieu of SmarTrip cards on the DC Metro or redeeming exclusive offers from Nationals corporate partners away from the ballpark,” the spokesperson explains. Since the program was announced, other teams have also shown interest. The Boston Red Sox are reportedly launching a pilot for the cards and the Tampa Bay Rays have also been in contact with Nationals representatives.